Vous pouvez consulter le sommaire de l'ouvrage. Le mot de l'éditeur : Grand Canyon is considered one of the seven wonders of the natural world. It possesses one of the most visually powerful landscapes on the planet, with expansive vistas, airy heights, plunging depths, towering pinnacles, sheer-walled buttes, spires, mesas, temples, and the vast, multihued, labyrinthine topography. But within the deepest corners of the main Canyon itself, hidden away from the casual observer, are seldom-visited, smaller tributary canyons that exhibit stunning beauty, intimacy and opportunity for adventure. This guidebook is somewhat different from others in that the trips require the user to apply skills from the varied disciplines of backpacking, climbing, orienteering, rafting and technical canyoneering. The upside is that those willing to expand their skill set will find that previously inaccessible areas of the Canyon will become open to exploration. A packraft removes the impenetrable barrier presented by the Colorado River. Rope allows the descent of routes not otherwise possible for the non-technical hiker. Orienteering allows hikers to explore off-trail routes in the backcountry. As a result, this book should appeal to backpackers who wish to put together new loops and routes using a packraft, rafters who’d like to perform some canyon descents as part of their river trip, canyoneers who are looking for remote multi-day expeditions and more! The trips described in this book will guide the reader on some of the most beautiful and remote backcountry adventures to be found within the Grand Canyon. Ce livre a obtenu le prix du "National Outdoor Book Award for best Outdoor Adventure Guidebook" : If you’re into canyoneeering, Grand Canyoneering is a must-have. Handsomely illustrated with color photographs throughout, this outstanding guide includes thorough explanations of over 100 different trips into the tributary drainages and ravines of the Grand Canyon. Trip descriptions are supplemented with topographic maps, key GPS coordinates, and information on water sources, specialized equipment and natural history. 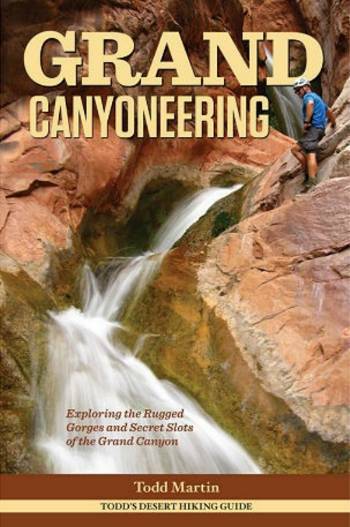 Todd Martin writes in a comfortable, conversational style which makes the guide a pleasure to read; yet, at the same time, he is exacting when it comes to describing canyon routes. The sheer volume of material alone is impressive, and combined with the photos, maps, and text, it’s decidedly a tour de force of outdoor guidebooks.